Gulpha Gorge Campground. Quarters are closer than I’d like for a park. RATES: $10 without hookups, $24 with full hookups. Holders of Interagency passes receive a 50% discount. GPS: N 34.52246, W 93.03510 Note: I had some difficulty getting my GPS reading to coincide exactly with Google Maps, either Map View or Satellite View, but it was pretty close. These coordinates mark the entry to the campground road. 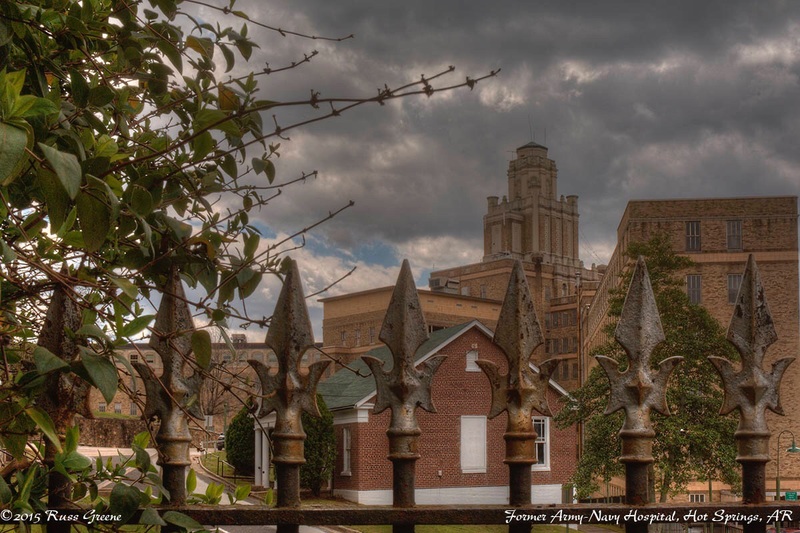 The old Army-Navy hospital, Hot Springs, Arkansas. It’s still in use as something else, but I’m not sure exactly what. ACCESS: Roads to and within the campground are paved. One site, #16, is shown on the campground map as being handicap accessible. SITES: 44, four of which are for hosts, 11 of which have no hookups, the remainder have full hookups. PULL THRU: I don’t think so. See the map. MAXIMUM RIG SIZE: The smallest site is 32″, the largest is 60″; most are in the 32′-50′ range. Dump: In the campground, politely referred to as Sanitary Station on the map. Propane: AllStays indicates Ferrellgas, Hot Springs, Arkansas 71901 – Ferrellgas,2250 E Grand, GPS: 34.50566, -93.00670. 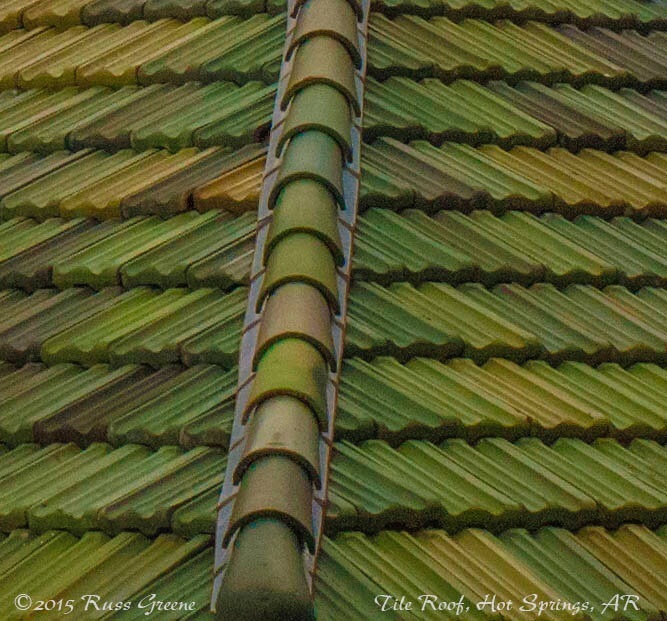 Hot Springs National Park is both surrounded by the town of Hot Springs as well as surrounding part of the town. 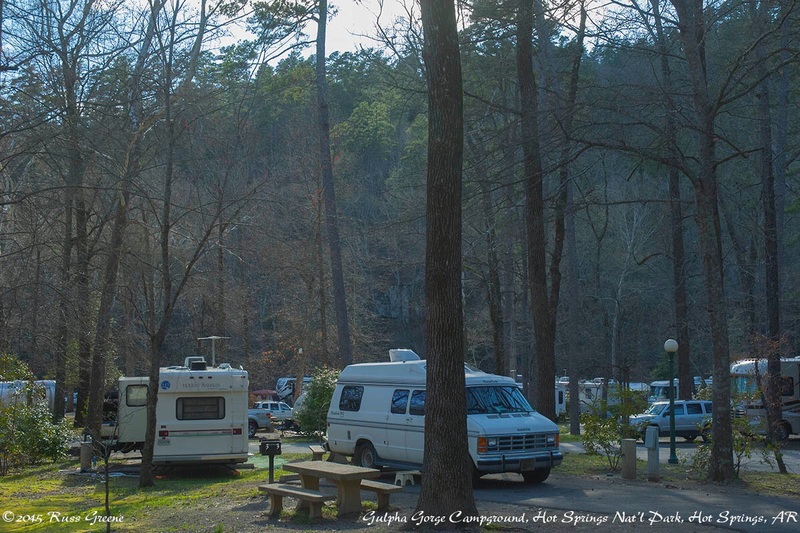 Gulpha Gorge Campground within the park is something of an oasis from the nearby community. At the same time, route 70B (Grand Avenue) skirts the SE edge of the campground and it’s busy with cars passing by most of the day. Site 21 where I camped was a little further from the road than most other sites but still, at maybe 200′ from it one could see and hear passing traffic. I do not recall noticing traffic noise in my rig at night. There probably isn’t much traffic then. This is, from all appearances, a popular campground. Pretty much all the sites with hookups were taken midweek when I arrived. Just the day before I showed up I was at Cedar Lake in OK where most sites at two of the three campgrounds there were vacant. 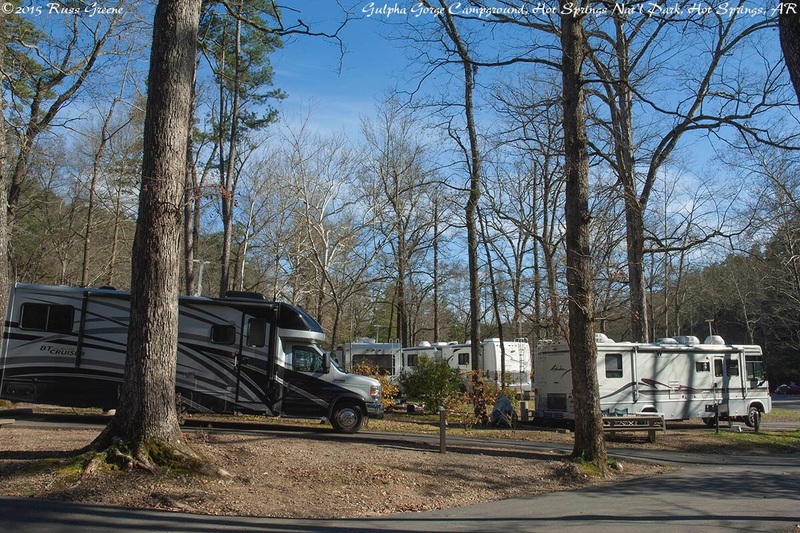 Gulpha Gorge Campground felt crowded. It’s small in size and it was full in the section with hookups. Free maps available in the building with the automated self-pay machine show quite a few hiking trails accessible from the campground, several leading to different parts of town and one to the Visitor Center and all the hot action in town. By hot action I mean the bath houses. Hot Springs, after all, sprung up (or is it sprang up?) around the hot springs. Whether it sprang, sprung or sproinged (is too a word!) I’ll leave up to you to decide. Obviously, you need a new dictionary! Hahah. As to snow on the east coast, I rather expect there is still some around, but I’m a long way from there and will be for a while. I’ll be in Mississippi tomorrow and for maybe a week or so after that, then Tennessee.